Print Home / Manage Forms / How Do I Receive SSL Submissions? 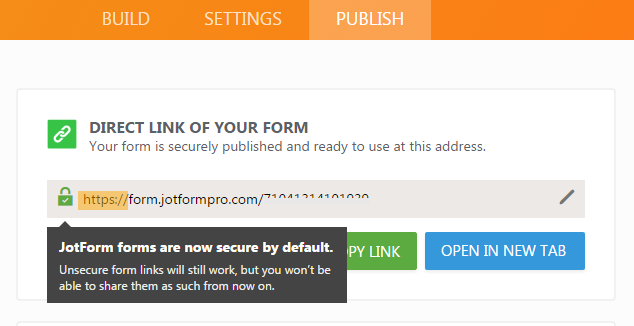 UPDATE: We are happy to announce that by default, all form direct links and embed codes are now secured by default. You can learn more about this news on our blog post here. Note: If you don't have a secure web server (i.e your website's address doesn't start with https) and you embed a secure form into the webpage, the end user's web browser will report the connection as not being entirely secure. In these instances, it may be better to provide a link to the form using its JotForm URL. Got questions or comments? Please post it below! I don't have a secure web server, but I'd like my pages that just have a banner, footer and navigation buttons along with embedded forms to appear as secure. What does it mean above when it says, "it may be better to provide a link to the form using its JotForm URL."? I don't understand what to do or what the result will be. I noticed that all the information that is collected is sent to the email of the client when they fill out a form and this is an e mail that is sent when they complete it. It lists all the submitted answers and this is not secure. We have to edit the email to take that information off. So this is not by default and it should be made aware since this is not noticeable immediately. I follow the steps in securing the form with SSL, and now the email i recieved is encrypted and cannot be read, how to return my form into not encrypted? I am using a template which allows for me to use my own background image. However, once I set it up and tried to load the form, I got the firefox warning box because my image is not secure and had to add an exception in order for it to load. Obviously, I don't want users to have to do that. Is there a way around that? I'm using Stripe integration to collect credit card information. Does doing so allow me to add a security certificate seal to my form? When I click "Preview," the link is https, so it seems like it is automatically adding that security, but the secure form checkbox listed under #2 in the instructions is no longer available when I click the Embed Form button. Before I upgraded, I had been blacklisted twice simply for trying the SSL feature. I was never warned not to use it. Now I have upgraded and would like to use it but I am so afraid I'll get blacklisted and locked out of the Control Panel again. Can you assure me this won't happen? Is it still possible to use Jotform to collect credit card information if you have an SSL certificate? I'm using the Form Generator for WordPress plugin to embed our forms and our IT department just installed an SSL certificate. I understand that now my form URLs require https:// - however, how do I achieve this via the plugin? Is the plugin now ineffective? As far as I know, I am not using any SSL forms under the free plan, but have been told I am up to my 10 SSL per month limit? How do I find out what is using up the SSL quota of forms. It is weird as I don't have the form embedded anywhere and it is just accessed through the standard non SSL Jotform web link? I use free version and didn't mark checkbox for secure SSL submissions and i use my form integrated with social network. But stats shows that i am over limit and i got email. We have our own SSL certificate - is there a way to use our own cert instead of yours? is this secure for credit card info, or other sensitive information? How do I remove the secure code function? I have a paying feature in my form though. I remember seeing an answer about HIPAA compliance on your website somewhere, but can't now find it. Does using the secure form with your URL meet HIPAA requirements? we are using a free account. What is the limit to the number of SSL submissions in a year? Is there a way to not send people to a verification page (a captcha) after the submission? I only want the form to be secured in a https, just because my web is. So if it is not secured, it will give customers a SSL error. Is there any way to create auto generated receipt for submitter with receipt number...??? I generated a secured code but when I publish it, instead of getting a form, it just shows the address..."http...."
Hi Imusing opera browser and direct jot url https://secure.jotformeu.com/form/30403376168351 however the ssl security icon in browser says "site not secure" Can you advise? How can you take the secure encryption off of a form? I sent one out, unknowingly, then received an email saying I'm going to have to upgrade or my form will expire in 2 days. Earlier I used to recieve forms and said that it came from so & so like Jack Smith. Now it appears in my inbox saying it is coming from Jot Form. Can I adjust the settings to say it has come from my client. I've embedded the SSL on my form. However, the graphic says, "Click to Verify" and it isn't linked. How and where can I link the graphic for verification? I am unable to get the email submission form work. Can you help me please? Hi Jotform, is the SSL working fine? since the DDos attack, I get people saying that the form isn't showing, or the link has a cross through https, i have checked, and everything seems fine. this is quite important due to using payal pro. and folks entering credit card data on the form. just adding this in if it helps anyone, because I had problems with mine as well.... make sure you also change the word "form" to "www" in addition to adding the s to http. I try to open my form to insert in my secure website but does not work! @emccarron All you need to do is visit https://www.jotform.com and everything will be secure. I don't want to be emailed any of the information I collect with the form because it is sensitive data. I JUST want SSL encryption so I can securely download from the site. Will changing the address to https://... accomplish that? Also, where do I make this change? If I don't have a https website, what do you mean when you say I can give a link to a secure form? Thanks. how can i preview submissions before emailing them.